Why Finance High-Efficiency Air Conditioning Systems? When considering a system changeout, look for ways that the system can pay for itself over time. For example, a typical 3-ton base 14 SEER system will cost around $5,500-6,500. Even though this is the lowest efficiency for an air conditioning or heat pump system you can buy, $5,500-6,500 is still a lot of money and, often, an unplanned expense that will drain your savings quickly. Ready to apply? Scroll down to see details of our financing offers. Alternatively, you could upgrade to a higher efficiency system and allow that unit to pay for itself over time. For example, instead of the base single-stage system at $5,500-6,500, consider a two-stage heat pump with a variable speed air handler or an inverter system and the utility savings can be significant. The technology in these systems allows them to heat and cool your home with a lower speed compressor and motor operation than a single-stage system. Therefore, your energy consumption to maintain the desired temperature is much less than single-stage operation. Consider this analogy: imagine you’re driving a car from intersection to intersection. Is it more efficient to press the gas to the floor and go as fast as you can to get the next stop light and slam on the brakes to stop, or to use cruise control to maintain an optimal speed and slowly come to a stop? The answer is, of course, the latter option, and the same thought holds true in air conditioning. So, how can we make that high-efficiency multiple stage equipment affordable? 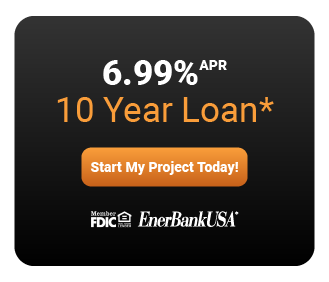 EnerBank and Greens Energy are now offering a 10-year, 6.99% fixed financing option. If that multi-stage, high-efficiency system is priced at $10,000, the monthly payment is only $116. Sure, it’s $3,500 more than just the base 14 SEER single-stage system, but if you saved just $50 per month on your utility bill, that’s $6,000 saved over the period of the loan. That savings will more than cover the upgrade as well as all the interest costs of the entire system! Let the utility savings of the more efficient system cover the cost over time. Furthermore, the manufacturer’s warranty is 10 years, which coincides with the average life of a heat pump system in Central Florida. If you added a worry-free 10-year labor agreement, you would have no cost of repair for the average life span of the equipment for only an additional $9.11 a month on this loan. 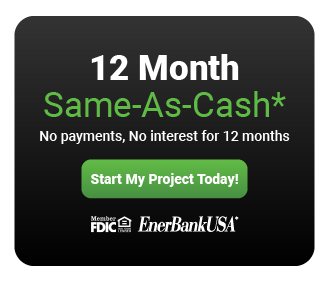 In summary, that $10,000 multi-stage high-efficiency system on the 10-year EnerBank loan pays for itself, covers the interest cost of the loan, and requires no out-of-pocket expense for a full 10 years for approximately $125 per month. Apply Now Using the Buttons Below! Talk to your Comfort Advisor for 36 month, 0% option! Contact a member of our team for more information on this financing special. *The Carrier® credit card is issued with approved credit by Wells Fargo Financial National Bank, an Equal Housing Lender. Apply for the Carrier® credit card by selecting the button below. Carrier® is a Registered Trademark of Carrier Corporation. If you choose to apply online, you must provide an e-mail address. If we are able to complete the evaluation of your application within approximately 45 seconds, we will notify you of the credit decision online.